Copenhagenize.com - Bicycle Urbanism by Design: How Many Bicycles? I hate questions that can't be answered. I'll get to that. Firstly, my friends at Baisikeli, who took these photos, are used to getting their fingers on used Danish bicycles. They rent old Danish bikes to tourists in order to finance sending bicycles to their workshops in Africa. We've blogged about them before. They get previously stolen bikes from insurance companies and they also scour the countryside looking for bicycle auctions in small towns or police auctions, in order to acquire more bicycles for Africa. In the photos above and below, they stumbled across a man out in the country somehwhere who has spent years collecting old bicycles. A lot of old bicycles. What you see in the top photo is only about 1/10th of what he has. He spends his time restoring them, but it's gotten out of hand. Many of the bikes are from the 70's and 80's, but there both newer bikes and much older bikes in the piles. Some real pearls to be found. A real bonanza. So here's the question that will never, can never be answered. How many bicycles are out there in Denmark? Used and unused? 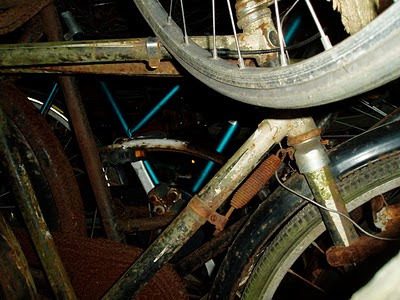 400,000 bicycles are scrapped every year in this country. Danes buy, on average, 500,000 new bicycles every year. I'm craps at maths, but that's 100,000 bicycles left over in a statistical no-man's land - each year. A million bicycles each decade. Then you have all the old bicycles in places like the farm, above. All the bicycles in sheds in summer houses. All the bicycles in the cities. On the muddied bottoms of lakes and canals. 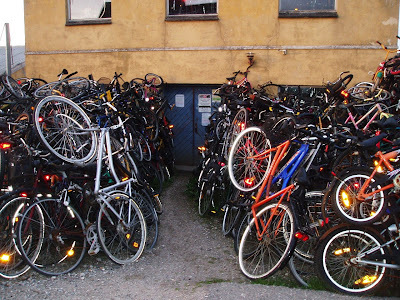 The city in which I live, Frederiksberg, which is in the middle of Copenhagen, just gathered up almost 3000 abandoned bicycles from bike racks in the city in their bi-annual clean-up. There are only 90,000 citizens in Frederiksberg. Think about all the other bike racks in all the other cities in Denmark. How many bicycles in Denmark? Old and new? Total?